By creating CRACKLE, Sony hopes to stray away from the copyright infringing past that Grouper was once associated with by placing a new agenda on original web series. 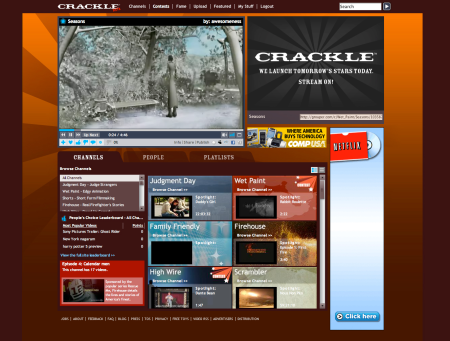 CRACKLE isn’t just another site to find original web series, it a place where original content creators can develop. If chosen by the CRACKLE team, creators are given funding and, in some cases, allowed to work with the higher-ups at CRACKLE Studios. What could be funnier than a gay web series? How about a gay web series that isn’t actually gay? Gaytown lead character Owen only pretends he’s gay so he doesn’t hurt his friend’s feelings. Talk about a classic web series concept! “What could be funnier than a gay web series?” you ask. How about a group of frightened heterosexuals–preferably right-wing politicians and fundamentalist preachers–getting beheaded by righteous pro-queer activists right there on prime time television? Oh ha ha ha ha ha. Hilarious.